Comedian Terence aka Sasa Kamami has opened up about his street life saying it was one of his toughest times in life. 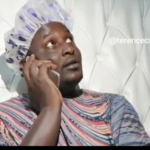 Speaking in an interview on NTV, Terence better known as Lawrence Macharia said he spent seven years of his life in the streets after his mum died. He and his brothers then had to move in with their grandma in a single-roomed house situated in Nairobi’s Mlango Kubwa slum but said he got tired of the lifestyle and ran off to the streets. “”It was a tough thing. Street life is not easy. I stopped being a street urchin when I was around 16-years old. The whole process took two years. I went through detoxification and got it all out of my system,” the comedian said. English View this post on Instagram Tag someone who would do this #teamkamami @millanetai A post shared by KAMAMI (@terencecreative) on Apr 8, 2019 at 1:58am PDT The comedian added that he was a bit lucky because he knew how to speak English therefore made more money that his friends. “I remember I had a lot of money when I used to live in the streets. I was the street kid who spoke English so people would often leave some money for me,” he said. The post Comedian Terence says he used to have a lot of money as a street kid because he could speak English appeared first on Ghafla! Kenya.